Normally the Sonoff switches don’t support MQTT but you can buy flashed devices that run the Tasmota firmware that does. 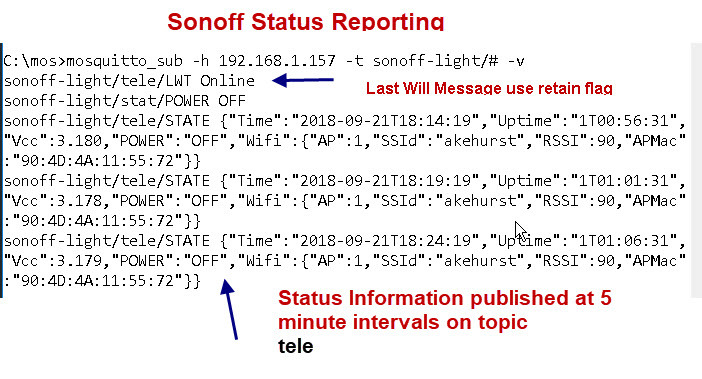 The Sonoff-Tasmota firmware provides three interfaces: MQTT, web and serial that can be used for controlling the switch. 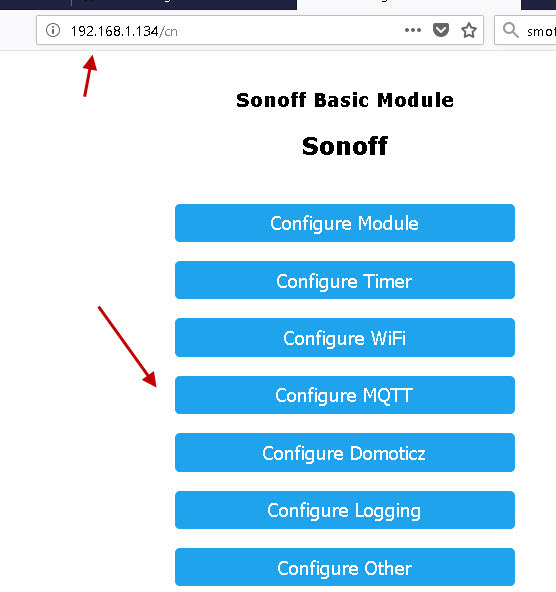 In this tutorial I will cover basic setup of the Sonoff Tasmota MQTT Basic Switch and how to use MQTT to control and configure the switch. How did you get Tasmota Sonoff? There is just a single button that is used to control the switch. It can be used to manually toggle the switch on/off or to place into various configuration mode depending on how often it is pressed. This link here has an overview of the button options. To configure the Tasmota switch you need to connect it to a Wi-Fi network. The switch connects to a Wi-Fi network just like you mobile does and so s you will need to configure the SSID and password of that network. The easiest method is to use WPS followed by the android App. With this option the switch starts as a Wireless Access point. The SSID on mine was sonoffbasic-1122. You then need to connect a computer to this access point and go to the IP address 192.168.4.1. You can then enter the SSID and password of the Wi-Fi network you will be connecting the device to. When you enter this information into the webpage the switch will restart, connect to the Wi-Fi network and acquire an IP address. Now in order to configure it further you will need to know the IP address it has acquired. This isn’t as easy as it sounds but the device name on the network seems to be set to the same as the access point. So you could try to ping this network name which should give you the IP address. 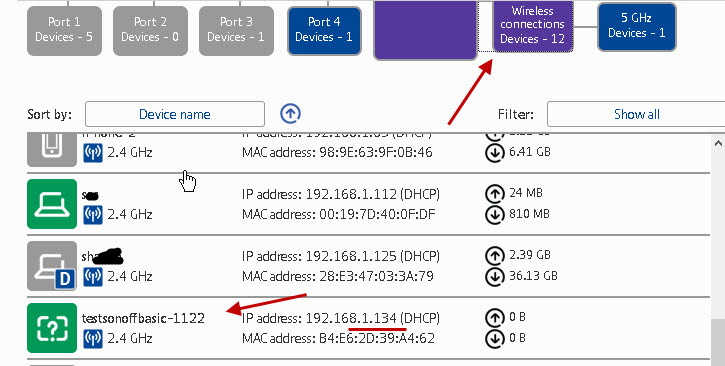 On my network the BT Home Hub displays all connected devices and was able to find the device IP address there. (screenshot below). The switch will start as an MQTT client and also a web server. Topic – The client will publish and subscribe on this topic. The name should be meaningful. Full Topic -Defaults to topic/prefix -prefix is stat,cmnd or tele see below under MQTT default topics. When finished save the configuration and the switch should restart. Sonoff will subscribe to topics to receive control commands . It will also publish status information to topics. Deciding on the topic structure is an important part of the configuration. Each Sonoff device has a unique name which you configure in the topic section ( shown above). prefix +topic (%prefix%/%topic%/) or topic+prefix (%topic%/%prefix%/). Another option and my preferred option is to add your own prefix. In this case I prefer house/topic/prefix. sonoffs is the group name. It also publishes its status and a Last will message wth the retained message flag set..
Below is a screen shot showing the messages sent by a sonoff device starting up. You can control the switch i.e turn it on/off using either http or MQTT. This is important to note as some systems may require http and if you have an existing control system that uses http then it might be easier to use that rather than going to MQTT. This tutorial will mainly cover MQTT but I will also be covering http in another tutorial. In the example below show how to so it using the mosquitto_pub client. You can use the curl command or easier still a web browser. Note: %20 s a space. The above topics are prefixed with the switch topic e.g. Besides turning the switch on and off, commands can be used to set various settings like the MQTT broker, port retain flag etc and the get information about the switch. The switch uses a command response structure. Each command is acknowledged with a response. The result is contained in the message payload. 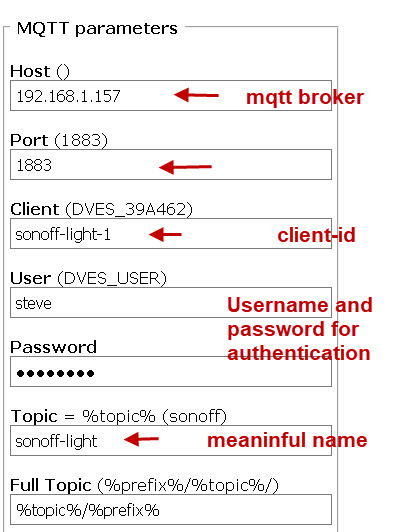 The screen shot below shows the command response messages for setting the MQTT retain flag on the mqtt client. A collection of devices can be controlled by setting them to use the same group topic. You should note that setting a group topic causes the switch to restart as it needs to subscribe to the new topic. That was an excellent article. I followed all your steps, I have created a broker on a raspberry pi 3, and I have connected a NodeMCU with Tasmota firmware through MQTT. Everything is OK and I am able to subscribe with my android phone to a post that the NodeMCU publishes and get all the updates. But my problem is that if my android phone is offline, and NodeMCU makes a publish, when I reconnect with my android phone as a subscriber, I miss the publish NodeMCU made when my phone was offline. I have already configured the mosquitto broker on raspberry pi with persistence true and cleansession false as I have read on other forums. Is anything I miss and I am not able to get any published messages when my client is offline and online again? You need to subscribe to the broker with clean sessions set to False and publish and subscribe with a QOS of 1 .
excellent job, very clear and informative ! Thank you very much ! Excellent first time info , all in one place. I am planning to experiment on a NODEMCU board with TASMOTA and a simple MQTT Broker on a Raspberry Pi 0/W. This would be a Good starting point. One thing that I could not easily find on the Net was how to Set the WiFi Credentials with the inbuilt WiFi Manager, which your site helped me in, Thank you. That was the first time I saw an excellent explanation about sonoff w/ tasmota. Great job! Thank you and congratulations. With that they work directly out of the box as MQTT Clients with your python script. Tks for the link. I was looking the other day on Amazon UK and ebay and couldn’t find any flashed devices. I was thinking that I might have to learn how to do it myself, and not looking forward to it! 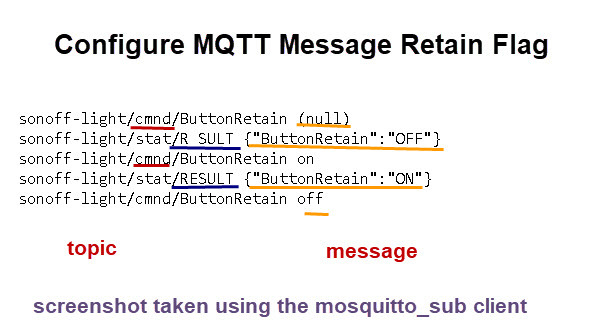 One suggestion for your description and text is to put MQTT somewhere in it. Perfect. First time I have found all this info in ONE PLACE and easy to understand. very helpful!! Thank you for breaking it cleary.